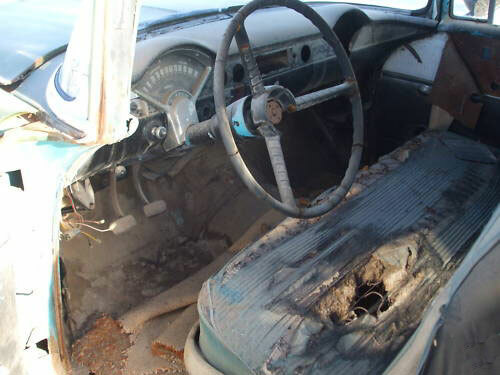 This Nassau blue 1956 Chevrolet 210 six passenger 4 door station wagon is a solid and mostly straight body, interior and chassis ready to be restored or customized. 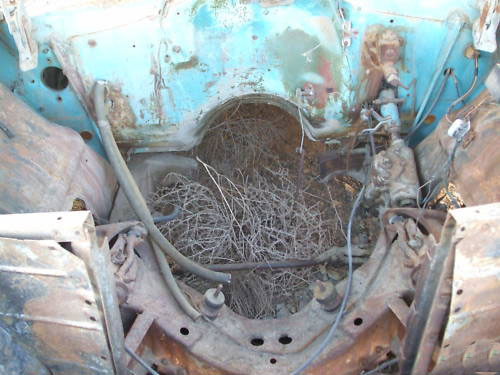 The car has been stored at it's current dry desert location since the mid-seventies. The body has solid and dry western desert sheet metal. The car has been painted green. The right front fender has been replaced. There are some small repairable dents and dings in the body. The left front fender is dented by the headlight and on the side in front of the door. The grill is bent and is loose on the left side.The front bumper is missing but a good bumper core is included. The hood ornament is missing and the hood lip trim is cracked. The left rear quarter trim is dented in the back. All the glass is good except the front passenger door glass is broken. The left backup lens is missing. The rear bumper is good. The blue interior is mostly all there. The dash and gauges are complete except the radio and right Chevy vee insert are missing. The dash pad is cracked. The horn ring and upper steering column ring are gone. There is a little rust in the driver floor. There is a large rusted area in the left passenger floor near the C-pillar where water collected over the years. The 265 CID OHV 162 HP V-8 motor and 3 speed manual column-mounted shift transmission and radiator are gone.The floors are solid. 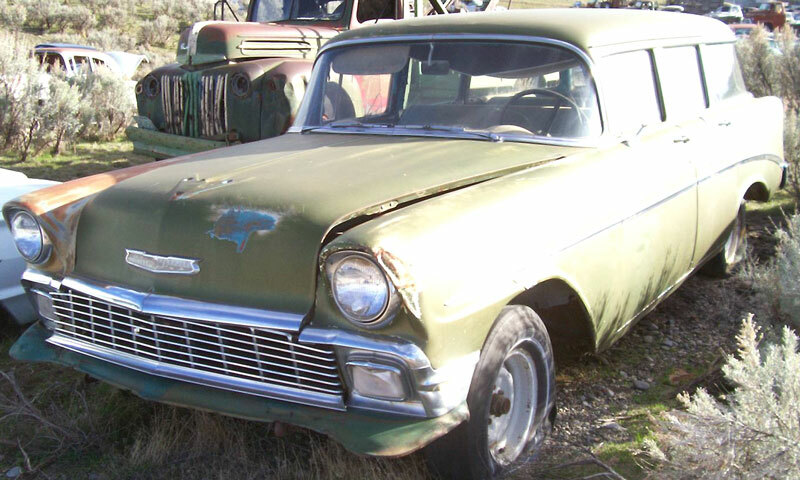 Here is your chance to restore or customize a desirable 56 Chevy Two Ten wagon. 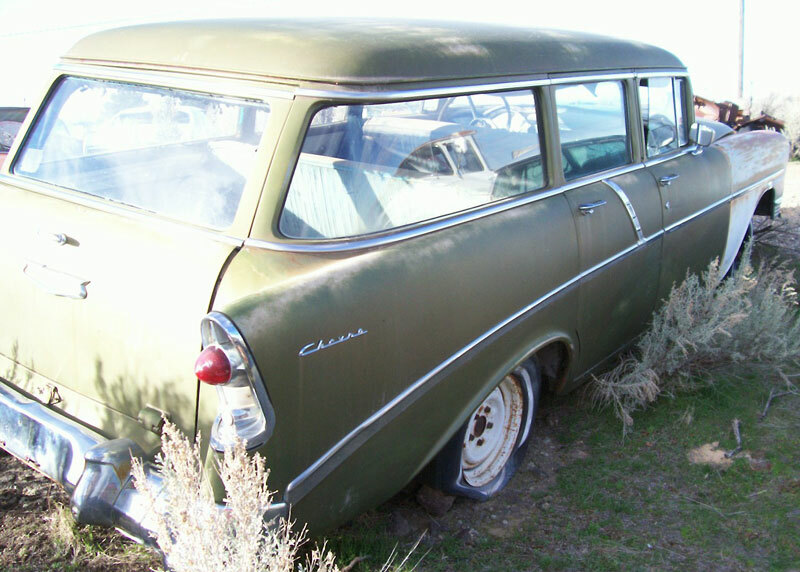 Please call (406) 318-0270 for details about this restorable classic 56 Chevy wagon project car. For sale $3,500.